For many homeowners that are unhappy with the current state of their kitchen, they likely know that they want to invest in remodeling. However, what if you are still on the fence and worried about the costs associated with kitchen remodeling? To make your decision to remodel easier, here are 3 signs it’s time to update your kitchen. The kitchen is often one of the most used rooms in the home and receives a large amount of foot traffic. If your countertops are damaged or your flooring is showing signs of heavy wear and tear, it may be time to start looking into budgeting for a kitchen remodel. Most homeowners will continue to try and patch damage they find, often costing more long term than updating the components with more durable solutions would. If you have an older home, it is likely that you struggle with finding a place for all your dishes, pots, pans and anything else that would normally be found inside of a modern kitchen. By investing in updating your kitchen cabinets, you can ensure that effective storage solutions are implemented to provide more space for the items you have. This includes hidden storage options and increased pantry space that can help update your kitchen and it’s functionality. If you are welcoming a new member to the family soon, or you have new accessibility needs due to age, an updated kitchen can help improve your kitchen for both added safety and functionality. 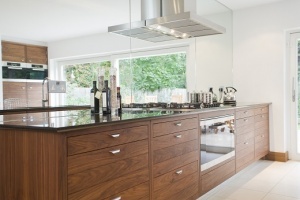 It is important to update your kitchen for the future and not for the present to avoid a costly update in the future. This process will generally open up your kitchen to make it larger and increase storage solutions. Previous Previous post: What Finishing Touches Can Enhance Your Kitchen? Next Next post: What Countertop Material Should You Choose?